(Zester Daily) As the new year unfolds, the world welcomes a fresh start, usually with hopes of a new beginning with some luck thrown into the mix. The practice of welcoming a new cycle in the calendar is probably one of the most universal holiday celebrations in the world, and it is often celebrated by eating legumes for luck. I love the idea of a new start as much as I love the seasons, and over the years I have relished the idea of welcoming the new year with simplicity and good, wholesome food. Legumes, including beans, peas and lentils, are considered to be symbolic of money, and thus considered a harbinger of prosperity and good luck in the new year. Several of them resemble coins, and the fact that they swell up when soaked in water also extends the analogy that the prosperity grows with time. Traditions vary in different parts of the world. In Italy there is a preference for sausages with green lentils eaten just after midnight. In a similar vein, in Germany they ring in the new year with split peas, while in Japan lucky foods eaten during the first three days of the year include sweet black beans. Closer to home in the southern United States, it’s traditional to eat black-eyed peas in a dish called Hopping John. When the dish is served with collard greens, the odds of prosperity are increased, because green symbolizes the color of money. On an Indian table, legumes are a cornerstone ingredient, soul food actually, something that we celebrate on days good and bad, so the idea of a bowl of legumes served any which way easily translates to good luck for me. Legumes are rich in protein and high in fiber and are lower in calories than most meat-based sources of protein, offering a healthy and filling option for your plates and palates. While most legumes will cook down to soft and satisfying goodness, they have a whole variety of flavors, tastes and textures to ensure your palate is interesting and innovative. Most beans and complex lentils can be cooked ahead of time in a slow cooker for four hours or for 20 minutes in a pressure cooker. Cook legumes with water and a little salt and use in your recipe as needed. Cooked beans and lentils can be stored in your refrigerator for up to five days or alternately place them in a zip-lock bag and freeze to use as needed. The water the beans are cooked in is actually fairly tasty and good for you and can be added to soups and stews. On any given week, I have a few of these bags handy and ready to be added into flavorful dishes, assuring me full-flavored stews without the trappings of extra sodium and preservatives. For your new year, I offer you two versions of classic dishes the way we enjoy them in my household and a recipe for collard greens to ensure we are in the green for the coming year. For my recipe for this Southern dish, I have actually ditched all meat-based products to create a dish that is flavorful and delicate. If served with love and affection, it will indeed convince you that this year you shall be lucky with or without money. My secret ingredient is that I do, in fact, cook my black-eyed peas from scratch and save some of the simmering liquid to use for cooking my rice dish. The dish resembles a pilaf, which probably takes it closer to the Senegalese roots of this traditional dish. Of course, to maximize the green, I garnish my variation of Hopping John with finely chopped green onions. New Year’s or otherwise, add this dish to your table and you are bound to feel well-nourished on a cold day. For a quick visual of how to make this dish, watch this video. In a pot with a tight-fitting lid, add the olive oil and butter and heat until the butter is melted. Add the onion and garlic and sautÃ© for about 5 minutes, until the onion softens considerably and begins to turn pale golden. Add the celery and carrot and stir well. Stir in the rice and mix well. Add the stock or the water and cup of black-eyed peas. Add the salt and the pepper and bring the mixture to a simmer. Cover and cook the rice for 18 minutes. Note: This time works for basmati rice; for other rice varieties allow a few more minutes. Essentially the rice should be soft and all the water should be absorbed. Let the rice rest for about 10 minutes, then remove the lid and fluff. Sprinkle with the red wine vinegar if using and garnish with the green onions if using. Note: If you are cooking the black-eyed peas yourself, save the cooking liquid and use it for the rice, in lieu of the stock or water. This southern Italian dish is often made with brown lentils and spicy Italian sausage and often enjoyed on New Year’s Day. 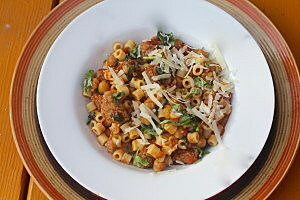 I make this with chickpeas and add lots of fresh basil to provide a fresh touch of brightness. Since we like our flavors spicy, I use andouille chicken or turkey sausage and add in some freshly ground cumin and fennel. For a quick visual on how to make this dish, watch this video. Heat the oil and add the minced garlic and cook until the garlic is pale golden. Add in the onions and sautÃ© until soft and wilted (about 4 to 5 minutes). Add the chopped tomatoes and the sugar with about 1/2 cup of water. Stir in the salt and bring to a simmer. Add the chickpeas, sausage cumin and fennel and cook through for about 2 minutes. Turn off the heat, garnish with the chopped basil and Parmesan and serve. 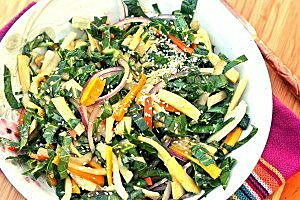 This dish is a beautiful medley of root vegetables, tossed with very finely chopped collard greens tossed in an assertive Asian-inspired marinade. Peel the turnips, carrots, parsnips and julienne into thin strips. Place the vegetables in a roasting pan. In a small bowl mix the olive oil, ginger, maple syrup and the tamari, and drizzle the vegetables with the mixture. Roast the vegetables for 20 minutes. Meanwhile, stack the collard leaves over each other and thinly slice the leaves, to create a chiffonade. Place in a large bowl. Add in the roasted vegetables, reserving the pan juices. Pour the pan juices into a mixing bowl, add in the sesame oil, cayenne pepper, olive oil and vinegar and mix well. Add the dressing to the collard and vegetable mixture and toss lightly. Sprinkle with the sesame seeds and serve.